presentation is not my strong point (as the photos will prove)....but in spite of this they were delicious, light and really easy to make. It is really worth the effort to make the gnocchi yourselves - but if you don't want to a shop bought pack of pre-made will do just fine in this recipe. put all the ingredients together in a large bowl and bring together with your hands to form a smooth dough. Be careful when adding the flour as you may need slightly more or less depending on the moisture in the potatoes. cut into 1.5cm widths then squash with a fork to leave a mark from the fork prongs - this helps the sauce stick to the gnocchi. leave on a lightly floured board or plate and put in the fridge for 15-20 minutes to 'set' before boiling. 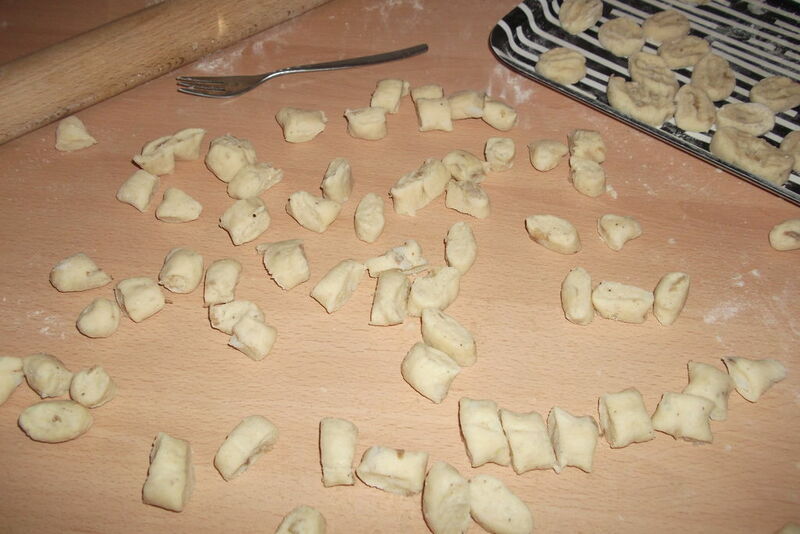 when the gnocchi float to the top cook for a further 2-3 minutes then drain carefully with a slotted spoon - leave to one side until ready to assemble. chop the leeks, mushrooms and ham then fry off in butter and olive oil with the chopped sage until softened (about 10 minutes). Add salt and pepper to taste. add the butter, flour and milk to a pan and bring to the boil stirring all the time to avoid getting lumps. when its boiling keep cooking for a further 2-3 minutes to make sure the flour is cooked out. take off the heat and stir in the cheese. bake at 200C for about 15-20 minutes until its heated through and the topping is bubbling and golden. I served this with a nice glass of red wine and some crusty bread. Buon Appetito! Nice one! I think I'll make this with my daughter this weekend!